We welcome everyone to come to our backpacker hostel in Hualien, Taiwan. We are not only offering clean beds and environment but also providing a communication area for you to know other travelers from everywhere. 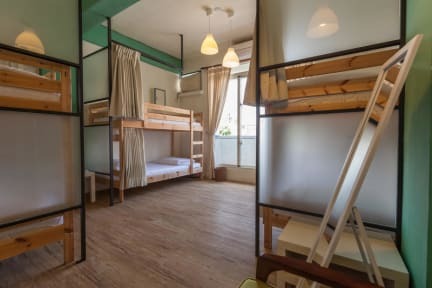 SlEEPING BOOT Backpackers Hostel is popular with independent travelers. We offer you budget accommodation in the best location in town. We are located at: No.73, Jinfeng St, Hualien City, Hualien County 970, Taiwan., which is near Hualien Main Station. It is only a 10-15 minute walk from SlEEPING BOOT Backpackers Hostel to Hualien Main Station and downtown Hualien. I had an amazing stay! Everything so clean and pleasant. Staff is lovely and very helpful. Thank you very much. Definitely will come back here when I return to Hualien next time. Great staff, great facilities, great location. Plus Taiwan is a great place. Taiwan Numba Wan! Sleeping Boot was clean and centrally located. We walked to the train station to catch the bus to Taroko and we also walked around to the night market and a bunch of different delicious restaurants. The hosts had maps in Chinese and English for my friend and I and pointed out recommendations for local food. Showers were hot and clean! Friendly staff, super helpful about any questions I had. Would recommend to stay here again. Wonderful hosts. They have also provided us with a map of their recommendations for eateries nearby which turn out to be superb. The location is slightly far from the town center and the famous night markets there but still walkable. Sleeping Boot is the first review I am leaving because Nick is the man and he made my stay awesome. He was super kind and even gave me a ride to the train station to ensure I secured my onward journey ticket. I will be back! Thanks Sleeping Boot and Nick! Lots of potential - maybe it's just me, but I didn't really get what all the fuss was about. There were a lot of long term "residents" when I was there so not much in the way of atmosphere. Beds were very soft - not ideal for me - and there was lots of natural light in the room which made sleeping difficult even with the curtains. There's no alcohol allowed in the building - which isn't mentioned on the advanced info they send you. Taroko Gorge is amazing and the city is great.